The WRO Art Center’s 2005 publication of From Monument to Market: Video Art and Public Space→ was the first of several works focussing on selected issues in the history of Polish media art. From Monument to Market comprised a book of articles about theory and history plus a set of DVDs presenting a selection of video works. That same format was followed by subsequent WRO publications, including Józef Robakowski’s Energetic Images: Bio-Mechanical Recordings (2007) and The Hidden Decade: Polish Video Art 1985-1995 (2010). The aim of these sets was to present source materials, historical studies of them and rarely-seen video works in a way that would appeal to the general public and at the same time be of interest and value to specialists researching and/or curating contemporary art. In the early stages of preparing From Monument to Market, there was some apprehension that publishing an open edition of video works would mean that serious art institutions would lose interest in exhibiting them, but those fears proved to be unfounded. From our perspective today it’s clear that the featured works have not been neglected by galleries and museums at all – on the contrary, they’re now included more frequently in exhibitions and collections both in Poland and abroad. This new on-line reissue of From Monument to Market includes nearly all of the original bilingual edition, but with certain changes. The articles from the book have undergone fresh proofreading and correction, and have been given a new interactive format with references and hyperlinks leading to the relevant works in the collection of videos. 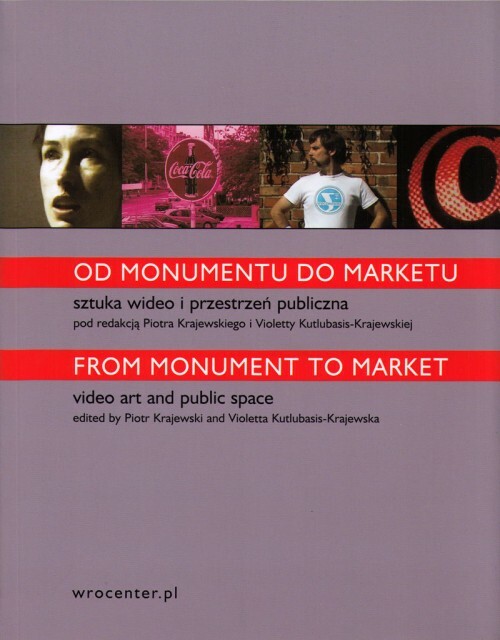 We’ve added Piotr Krajewski’s 2005 lecture at the Łaźnia Centre for Contemporary Art – “From Monument to Market: the World Re-Coded”, which delves into selected issues related to the axiosemiotics of public space. The selection of videos in the internet edition are still divided, like the DVDs in the original edition, into two programs; but again certain changes have been made: All the video works are now provided as MP4s; the WRO watermark has been added; and they’re outfitted with new metadata. In place of the excerpt in the original edition, Zygmunt Rytka’s Retransmission [Retransmisja] is now included in full. Two of Józef Robakowski’s longer works, Art Is Power! [Sztuka to potęga!] and From My Window [Z mojego okna], have been replaced at the artist’s request by selected stills from those works; and his short piece Cars, Cars [Samochody... , samochody...], not included in the original edition, has been added to exemplify Robakowski’s “own cinema” concept. Additional videos from the Lyying Community [Wspólnota Leeeżeć] group, whose 1990-91 works had a great deal of impact on the transformation of Polish public space, constitute another important addition to the video collection offered in this internet edition. The online edition of From Monument to Market has benefitted greatly from the experience that the WRO Art Center has gained from numerous internet projects we’ve developed over the years. The result is a highly functional and friendly system for accessing WRO’s video collection and accompanying texts, which we trust will provide users with hours of rewarding and enlightening viewing and reading.